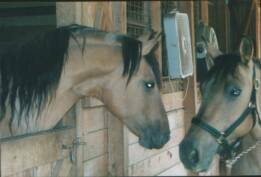 Pepper in the BLM holding pen, December, 2000. Pepper foaled a filly nineteen days after adopted, adoption date, 3/10/2001. 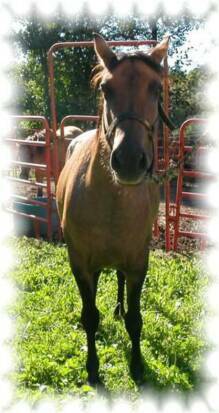 This is Peppers story, a sweet little Dun mare that ran the hills of Utah for seven years. Pepper was born in the Sulphur Springs area of Utah in 1994, ran free with the herd and saw the hardships and the glory of freedom. 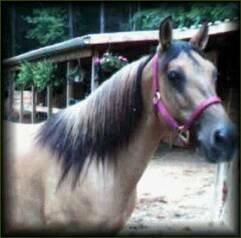 In the winter of 2000 Pepper and others in her group were rounded up for the BLM adoption, Pepper was heavy in foal and terribly thin. Her world of freedom had ended, but a new life was ahead of her. Little did I know at that time what an impact this mare would have on my life. 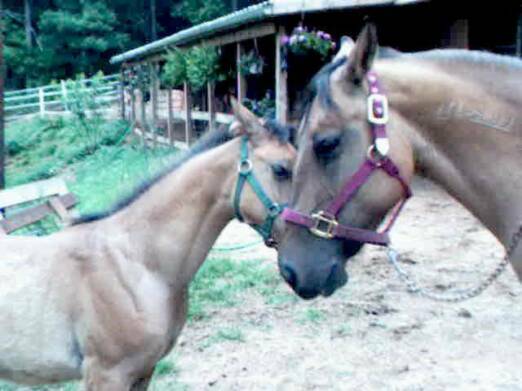 The adoption of a feral horse is one of the greatest challenges I have encountered, the old expressions from the Old Timers of the "Crazy Mustangs" kept coming to mind. As I watched Pepper I soon realized just how intelligent she was,she was fearful, she was feral, a wild creature that had never seen a human. Her fear was understandable as with any wild creature. Her interaction with the other horses was way beyond what I had expected, she was using the language of the horse, an experience I thought I would never see. How fascinating to watch, her intelligence was far beyond my domestic horses. 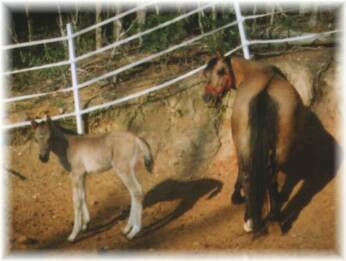 Is a feral horse for everyone, no, it takes time and a full commitment to these horses. These horses, not just the Sulphurs, any feral horses are a creature that has known nothing but freedom and the fight for survival. You must truly want to spend all your time and energy in training. The training must be correct and humane or you will never reach your goal of having a wonderful companion as I have in mine. Pepper has been at Bray Ridge for four years now, has produced a beautiful filly, foaled nineteen days after adoption and a stunning stud colt. 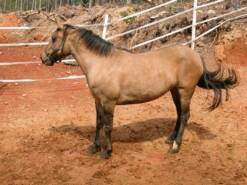 Pepper is broke to ride and is one of the most trusted horses at Bray Ridge Farms. 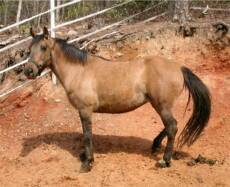 She is naturally gaited and is ridden with a Bosal Hackamore. Design by "Wiley Coyote Super Genius"
Copyright © 2001 - 2006 All Rights reserved.